For the next two weeks I am going to post some delicious recipes that you, my darling readers, can make for Thanksgiving. I have to be honest with you, so far in the nineteen years that I have been here, the most memorable Turkey Day food wise was a Soul Food Thanksgiving feast prepared by a friend’s mom and sisters about ten years ago. I have to let you in on a little secret, I love a “Persianized” Thanksgiving table because you never know what you are going to get. I am always fascinated with the way the flavors of two cultures come together. Since I have a blog that is soley dedicated to Persian food, that’s what we are going to talk about from now until Thanksgiving Day! Brace yourselves! 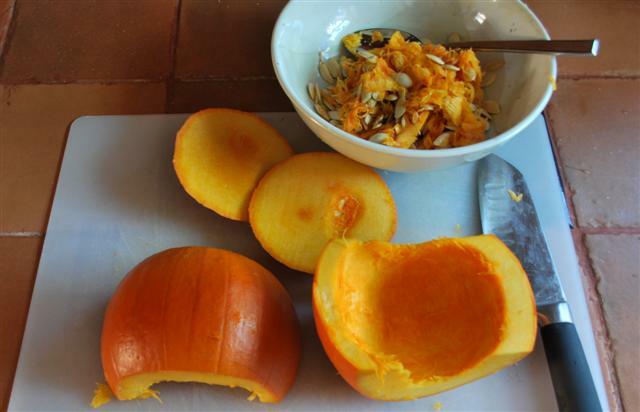 My love affair with pumpkin has been gradual. I was first introduced to it when I moved to the USA. It took me a while before I actually started liking it. 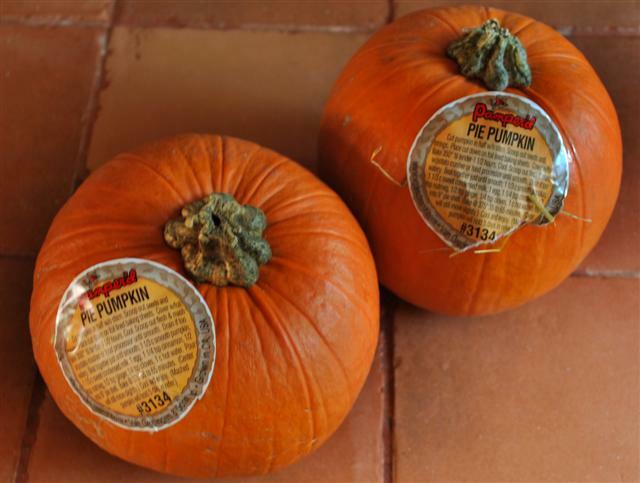 I gradually fell in love with pumpkin pie and in the past six or seven years I have been actually cooking with pumpkin. Note: I made a small batch because I was experimenting. 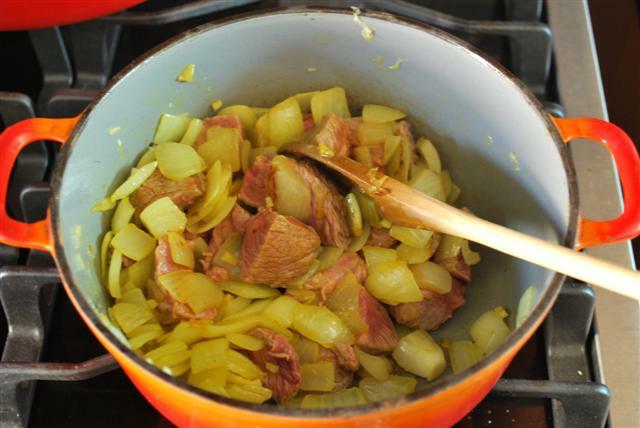 This recipe is good for two people. Please increase the ingredients depending on how many you are feeding. Sautee onion until translucent. 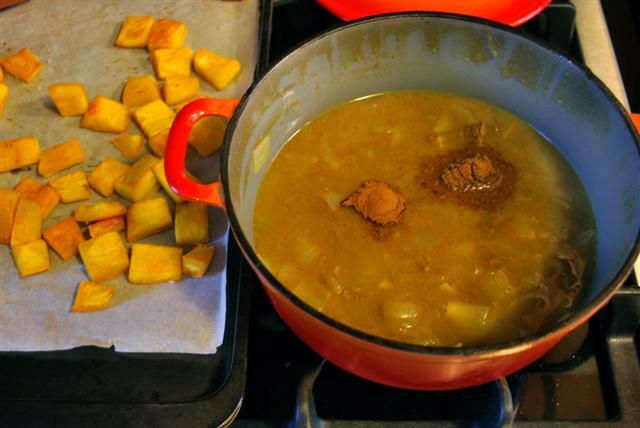 Add turmeric. Throw in the meat and let brown on each side. Season with salt and pepper. 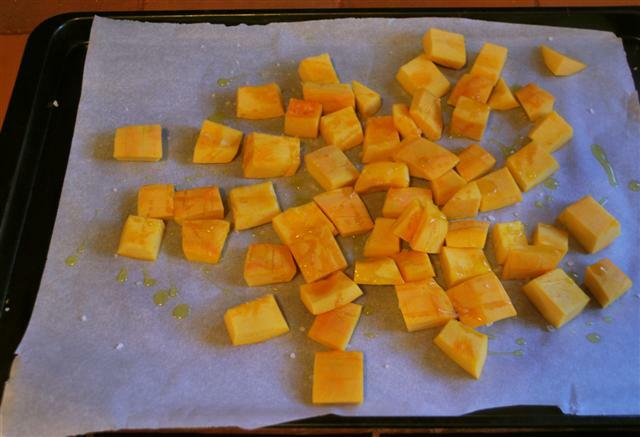 Add 2 cups of water, cover and cook for one hour. Look at them! They are so small and cute! All you need is one of them. 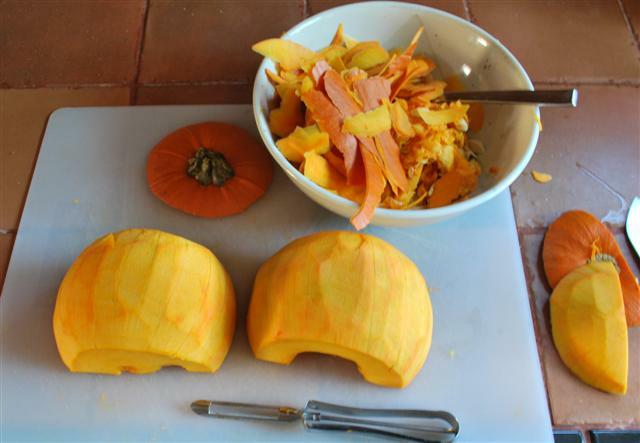 With a vegetable peeler remove skin. I learned this nice little trick from Nicole from Pinch My Salt. Cube the pumpkin. Place in a cookie sheet. Season with salt and pepper. Drizzle with olive oil and roast at 375° for 1/2 hour. 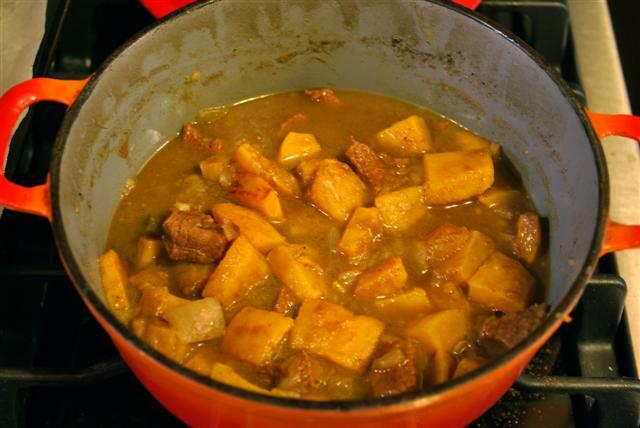 Add advieh and cinnamon to the stew. 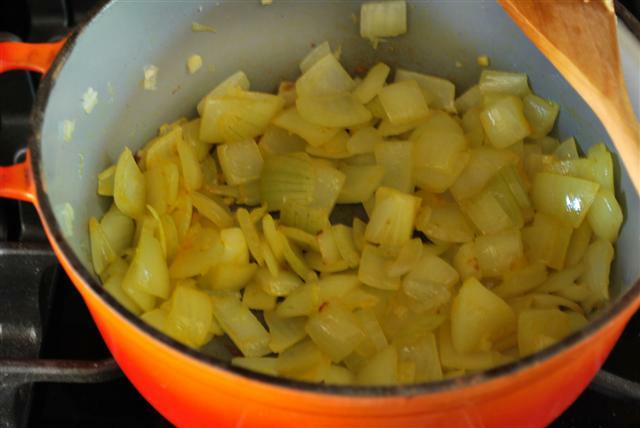 Adjust seasoning and cook for half an hour longer. 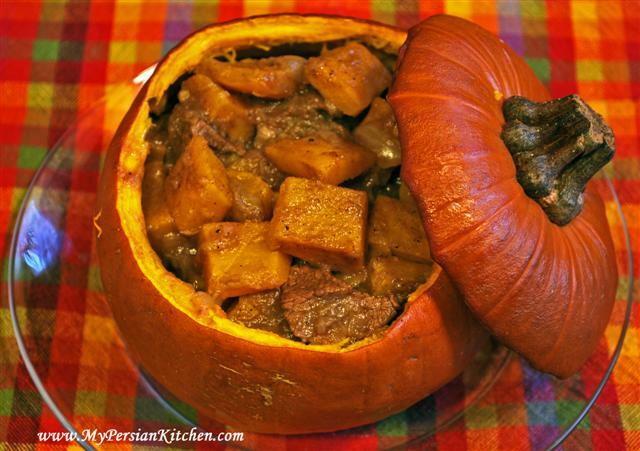 If you feel like being fancy you can serve the Khoresht in the pumpkin shell. All you have to do is cut the top part. Remove the seeds and strings. 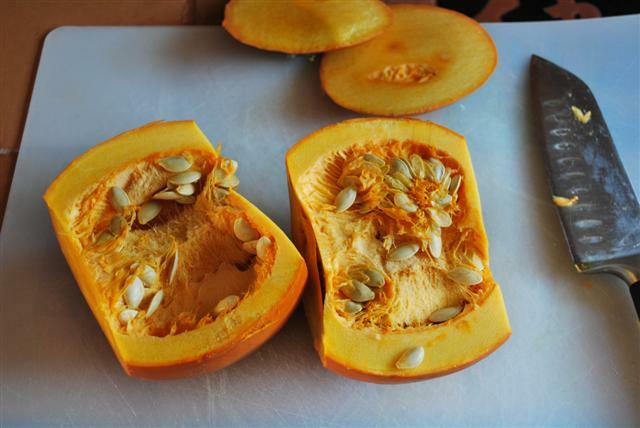 Bake the pumpkin for 45 minutes at 375°. 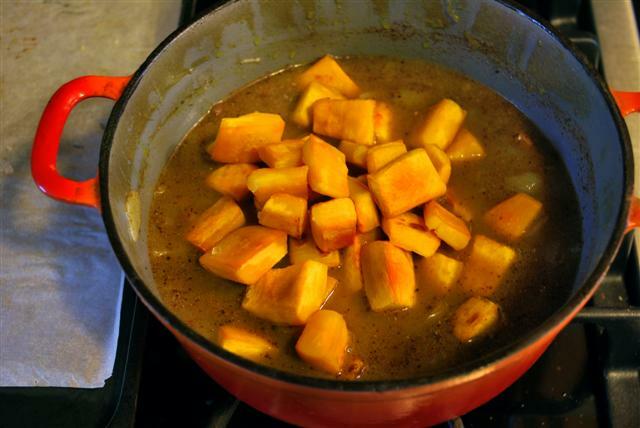 Serve Pumpkin Khoresht over rice. OMG!!! 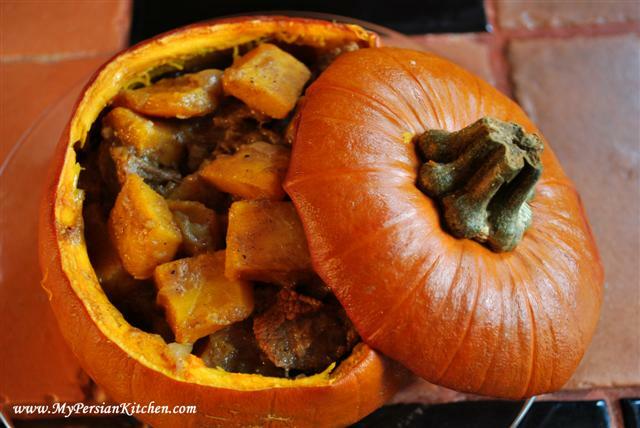 You have to bring a veggie version of that for T-day! I’m drooling like Indi with a bone on her nose. LOL Mr. B!! I might think about it. I am posting the stuffing recipe that I told you I would make for T-Day on Wednesday! Looks amazing. I love pumpkin! Glad you’ve warmed up to them over the years. They’re so tasty and much more versatile than many people realize. Me too Bria!! They are soo soo good! Do not forget to add Ghooreh .